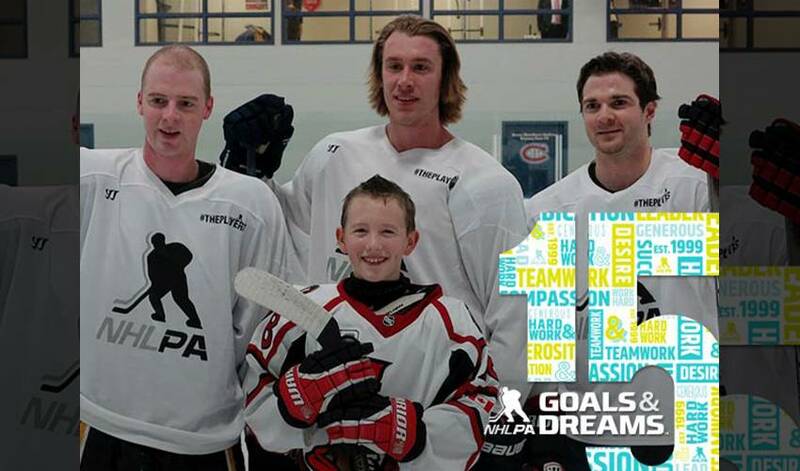 It’s perhaps fitting that the first stop on the NHLPA’s Goals & Dreams (G&D) fund 15th anniversary tour begins in Minnesota, a place known as the State of Hockey, where the sport has deep roots and a dedicated following. Consider it Hockey Day in Hastings on November 18, the city where a celebration of the game will be headlined by two major events: a team building boot camp with NHL players captaining groups who’ll face off in military-type physical challenges, and later on, the Goals & Dreams Cup between the two teams at the local arena. G&D, whose grassroots hockey assistance program, the largest of its kind in the world, has contributed over $22 million to grassroots hockey programs and related causes giving more than 70,000 children the opportunity to play hockey in 32 countries since being established in 1999, has developed strong ties to a pair of Minnesota-based organizations, namely, Defending The Blue Line (DTBL) and Hastings Minor Hockey. When Shane Hudella, the driving force behind DTBL, speaks of the impact that both G&D and NHL players have had on the organization he founded in 2009, the he does so with great passion and pride. The pair has worked together on several initiatives, including Tuesday’s boot camp. It’s an ideal association for DTBL, whose goal is in ensuring children of military members are afforded every opportunity to play hockey. In 2013, G&D donated 50 sets of brand new hockey equipment to the military youth supported by DTBL. Over the last four years, G&D has donated 325 complete sets of gear to their campaigns, including 25 for this event. DTBL counts several players as supporters. Brent Burns, Ryan Suter, Patrice Bergeron, Charlie Coyle, David Backes, James van Riemsdyk, Zach Parise, Alex Goligoski, Eric Boulton, Clayton Stoner, Chris Butler, Matt Martin, Paul Martin, Matt Hendricks and others have all lent their time and efforts to the cause. Coyle is appreciative of the impact G&D continues to have. What is at the root of the relationship between DTBL and G&D? Joe Harris, President of Hastings Hockey Association, found himself at a loss for words when 25 boxes of hockey equipment, courtesy of G&D, recently arrived at the local arena. New York Rangers alternate captain and Hastings native Derek Stepan, was the one who reached out to G&D. But, not one to seek the spotlight. As for that equipment, Harris knows just how impactful it will be for the Hastings hockey scene. While his opponents may not notice the stealthy Ryan Suter speeding up until it's too late, Minnesota Wild teammate Charlie Coyle has come to anticipate it.